The Thyroid Federation International estimates there are up to 300 million people worldwide suffering from thyroid dysfunction yet over half are presumed to be unaware of their condition. Hypothyroidism, an underactive thyroid, is one of the most undiagnosed, misdiagnosed, and unrecognized health problems in the world. It is an epidemic that is sweeping the globe yet doctors are failing to recognize and diagnose hypothyroidism. Hypothyroid patients are falling through the cracks of mainstream medicine, left to suffer debilitating and even life-threatening symptoms. What is going on? According to mainstream medicine, TSH (thyroid stimulating hormone) is the gold standard for the diagnosis and treatment of thyroid dysfunction. This hormone released by the pituitary gland in the brain stimulates the butterfly-shaped thyroid gland in our necks to produce thyroid hormones. Unfortunately TSH alone does not provide a complete picture. Most doctors typically don’t run a full thyroid blood panel nor do they investigate fully the patient’s medical history, symptoms, family history and thorough physical exam. They rely on this one blood test, TSH, leaving millions of people undiagnosed and suffering from debilitating symptoms. Many patients complain to their doctors of common hypothyroid symptoms yet because their TSH falls in the ‘normal’ range, their thyroid is declared normal. Patients will walk into their doctors’ offices complaining of fatigue, weight gain, and depression, and their doctors will pass them prescriptions for sleeping pills and anti-depressants and tell them to just exercise more, instead of recognizing the underlying thyroid issue. TSH alone does not provide a complete picture. If doctors are going to rely on TSH alone, however, they should at least give consideration to the controversy over the TSH normal reference range and consider this when diagnosing patients. Mainstream medicine relies on a normal TSH range from 0.5 to 5.0 with variations depending on the laboratory. However thyroid advocates and many integrative physicians are fighting to narrow that range to close to 1.0. Many traditional doctors rely strictly on the TSH range of 0.5 to 5.0 despite the patient’s obvious symptoms. 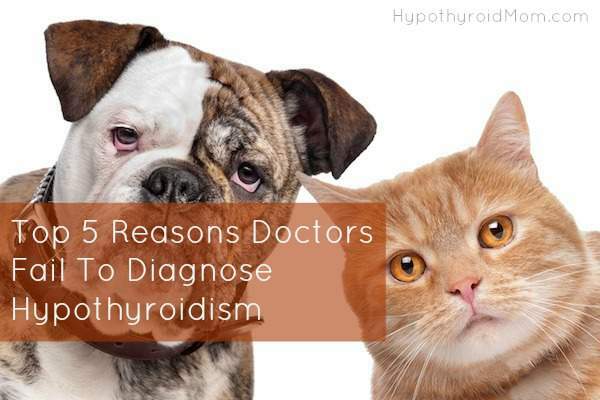 Then, there are other doctors who will only diagnose hypothyroidism once TSH is above 10.0! WHAT? By then your symptoms can be so debilitating you are struggling to live through each day! How can doctors diagnose and treat thyroid disorders without doing a full investigation? How can they hope to understand the complexity of their patient’s issue while relying on TSH alone or even a combination of TSH and T4? They are missing critical pieces of the puzzle. Patients are falling through the cracks left suffering debilitating symptoms all because of an outdated medical protocol. When the pituitary gland in the brain releases TSH, TSH stimulates the butterfly-shaped thyroid gland at the base of our necks to produce the thyroid hormones T4 and T3. The majority of thyroid hormones produced by the thyroid are T4, however T3 is the most active useable form of thyroid hormone that can be used in the cells of the body. The conversion of T4 to T3 is a critical element in this puzzle. By testing TSH and T4 alone, doctors are assuming that our bodies are properly converting the T4 to active T3. For many hypothyroid sufferers like me, our bodies don’t convert T4 to T3 properly. In the care of doctors who only tested for TSH and T4, my symptoms did not improve if anything they got worse. It wasn’t until I found a doctor open to full thyroid testing including Free T3 that my symptoms improved. She discovered that my Free T3 was low in the normal range (I personally feel my best when my Free T3 is in the top quarter of the normal range) and I was struggling. She was open to exploring the thyroid medication options to find what was right for me and that was a miracle for me. I’m now feeling fabulous despite hypothyroidism thanks to a combination of natural desiccated thyroid and compounded time-release T3. What a difference a simple change in my medication made for me. Thanks to a great thyroid doctor who knew to test my T3 levels, I got my life back. It should be about what works best for the patient, unfortunately in mainstream medicine this is often not the case. Now to add to the complexity of this, there is a difference between Total T4 and Total T3 versus Free T4 and Free T3. Thyroid hormones are fat soluble and the blood is mostly water. In order for the fat-soluble thyroid hormones to travel through the blood, they need to be bound to protein that act as little taxis to carry the thyroid hormones through the blood vessels to cells all over the body. When they reach the cells, the protein needs to be cleaved off because only the unbound “free” hormones can actually enter the cells and perform their necessary functions. Therefore Free T4 and Free T3 levels are important. Since T3 is the most active useable form of thyroid hormone that can be used in the cells of the body, Free T3 is critically important. Unfortunately most mainstream doctors do NOT test for Free T3 levels. I’ve heard from many Hypothyroid Mom readers from around the world on my blog, Facebook and Twitter that their doctors refuse to test Free T3 and even though they are suffering terrible symptoms on T4-only thyroid treatment their doctors refuse to change their protocol. This is an absolute tragedy! T4 must be converted into a usable form of T3 before the body can use it. In any given day some of the T4 is converted into a useless inactive form of T3, known as Reverse T3 (RT3). However in times of extreme stress, such as major emotional or physical trauma, surgery, extreme dieting, chronic stress or chronic illness, the body will convert a larger than normal amount of T4 into this inactive Reverse T3. Your TSH and T4 scores may look ‘normal’ however the person suffers hypothyroid symptoms due to the high levels of reverse T3. Few mainstream doctors test for reverse T3, declaring a patient’s thyroid lab tests completely ‘normal’ all the while their patient suffers debilitating symptoms because their reverse T3 was not tested. Hashimoto’s disease is an auto-immune disease where the body has turned on itself and attacks and destroys its own thyroid gland. It is a leading cause of hypothyroidism, yet mainstream medicine fails to test patients for thyroid antibodies. 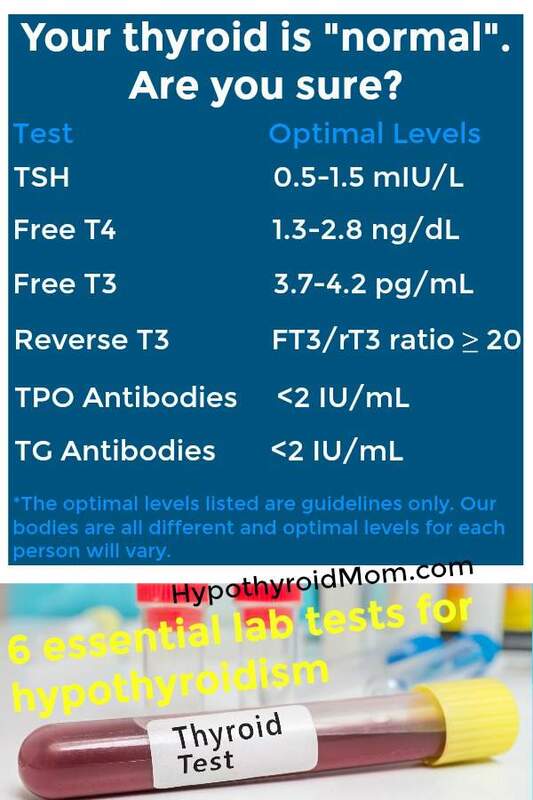 You can’t imagine how many followers here at Hypothyroid Mom have let me know after years of struggling with hypothyroidism they were finally diagnosed with Hashimoto’s after insisting on these two thyroid antibody tests – Thyroid Peroxidase Antibodies (TPOAb) and Thyroglobulin Antibodies (TgAb). The issue is that often times doctors do NOT run these 6 tests. If you find your doctor unwilling to run these tests, don’t hesitate to get multiple medical opinions until you find a doctor that helps. One of the greatest errors doctors make in diagnosing hypothyroidism is basing decisions strictly on lab results. Conducting a full thyroid blood panel can at least provide a clearer view of the issues, however even this often does not tell the full picture. These lab results, for example, do not test what happens to the thyroid hormones once they enter the cells of the body. Every cell of the body is dependent on thyroid hormones for proper functioning. There is no test that measures how well each cell is utilizing the thyroid hormone once it enters the cell. It is therefore possible for someone to have normal blood results but still be hypothyroid due to issues arising within the individual cells of the body. Each of us is unique and our requirements for thyroid hormones and our reactions to imbalances are all unique. Different people can have different individual ranges ideal for them. A great thyroid doctor is one that treats the patient, not the lab results. It’s important to get a copy of your lab results to check that all the recommended tests have been done and that your scores are “optimal” not just “normal”. There is a big difference. The thyroid gland is the master control center for the metabolic functions of every single cell in our body. Every cell of our body requires thyroid hormones for proper functioning. Therefore hypothyroidism, low thyroid, has the power to disrupt every part of our body and to produce profound changes in every aspect of our health. Unfortunately hypothyroidism is not given the attention it requires by the medical community and is often overlooked and considered a minor condition not worthy of much attention. This disease is vastly misunderstood and disregarded in mainstream medicine. A look at my post 300+ Hypothyroidism Symptoms…Yes REALLY will show you the severity of symptoms associated with hypothyroidism. It takes time to do an extensive clinical history with a patient including symptoms, physical examination, medical history and family history, and many doctors don’t take the time. They hurry to rush you off and move on to their next patient. Then there are those who have no clue at all that your 2 page list of symptoms that you brought to the doctor’s office has any connection to a low thyroid. They note the most obvious signs such as weight gain, depression, and high cholesterol. Instead of connecting them to the underlying issue hypothyroidism, they pass you prescriptions for anti-depressants and statins to lower your cholesterol and advise you to exercise more and eat less. They fail to connect the dots between your family history of heart disease, auto-immune disease, diabetes, kidney disease, gall bladder disease, liver disease, cancer and/or Alzheimer’s. Many fail to realize these deadly diseases are potentially linked to hypothyroidism. You walk into the doctor’s office with telltale physical signs of hypothyroidism, including swelling of your face especially the eyelids and below the eyes, obvious signs of fatigue, loss of the outer third of your eyebrows, dry thinning hair, pale dry skin, red irritated dry eyes, cold clammy hands and feet, brittle ridged nails, slowed reflexes, enlarged tongue, hoarseness of voice. Your doctor has no idea your physical symptoms are due to hypothyroidism. You are a walking talking poster child for hypothyroidism, but your doctor does not notice. Somehow we are overlooked by mainstream medicine. Perhaps our cries are not loud enough. Thank you so much. I have ALL the symptoms. MyDr. took the blood test and pronounced all was fine, that was over a year ago and it has only progressed NOW I WILL FIGHT FOR THE HELP I NEED! I’ve just started my quest for diagnosing my symptoms. Initial lab work said “all is well”. Nothing has changed. I need help. I live in Angoon Alaska bear Juneau . Can you direct me to a doctor here ? ?